I whipped up a makeup bag on Sunday. It barely took 15 minutes to throw together and the hardest part was locating a zipper foot for my sewing machine. The accessories for my machine are currently AWOL and will probably turn up at the bottom of a stash box one day. The benefit of having a spare sewing machine (or two) is having additional accessories. The drawback of owning more than one sewing machine is sounding like a person who can’t control her impulses but I figure they don’t make ’em like they used to. Besides both of us use them. Though only only of us sews makeup bags. This gentleman’s robe is made in a robust flannel and is based on Butterick Classics pattern 6968. I made a few modifications as the pattern I purchased from my local thrift store was a Medium and my beloved would typically wear a size L or XL, depending on cut. He also wanted a shogun-style robe which to him meant belt loops over the hips and no patch pockets. Patch pockets would be a risk – one bad interaction with a door handle and the patch pocket would be but a shadow of its former self. added belt loops. You don’t want your belt dropping in unguarded moments. the belt has an inner core of calico for strength and to increase longevity. pieced front band. The band is not matched. I don’t care and nor does my beloved. This was a design choice. no cuffs on the sleeves. Cuffs on a robe just get in the way, in my experience. Unless you have domestic servants. We don’t. We have to do our own dishes and then cuffs definitely get in the way. 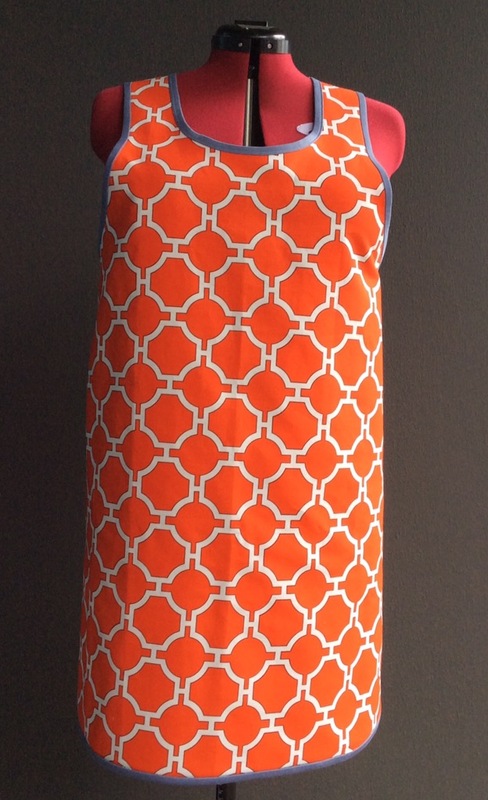 added 1 inch of width from shoulder to hem for increased coverage and comfort. Here’s a little throwback to the good old days of quality workmanship and pride in your product, in the form of cotton bias binding. I bought it at my local thrift store. Bias binding is something I look out for in thrift stores as it’s generally a polyester cotton blend when I buy it new and that is not my preference. The older bindings also tend to be better more stable, either due to starch or simply a tighter weave. The binding is made by WM. E. Wright Co in Massachusetts. This company stood by their product. This material is fast colour and perfect in workmanship. Should it be faulty in any way, making the article on which it is applied unusable, we will reimburse you for the reasonable cost of your labor and all materials used in making the article. 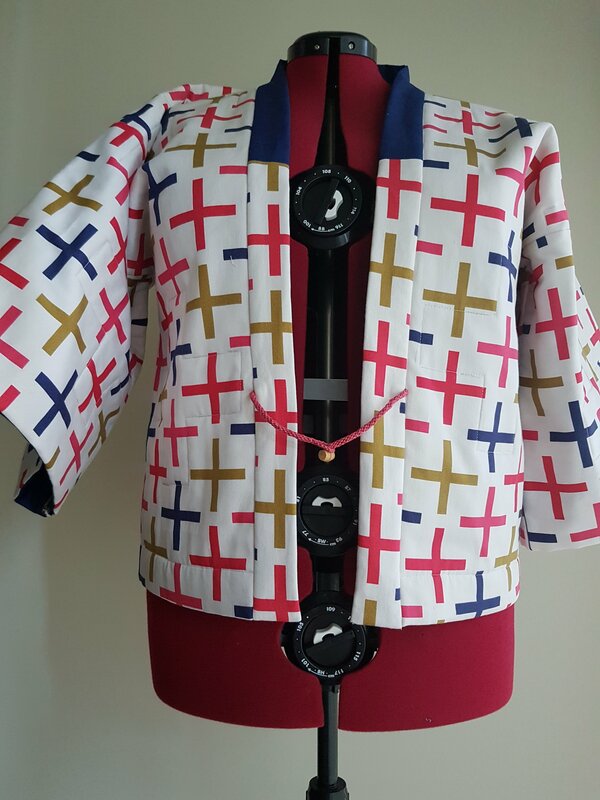 I wanted to be true to the origins of the hanten jacket, a padded garment traditionally worn by workers. Being true meant adding batting, which added complexity and a need for quilting. Adding batting meant adding a lining, which for me was unbleached calico from my stash. Following tradition meant having a contrasting neck band, which I read about online. Using a button closure meant braiding a round kumihimo eight strand braid for the button loop and button band. Using a round kumihimo eight strand braid closure meant learning how to transition that round braid to an eight strand flat braid so I could comfortably fit it under the sewing machine presser foot to attach it to the front band. Pattern Source: Clothing from the Hands that Weave by Anita Luvera Mayer from Kay Faulkners extensive library. In progress. I later swapped the fabric hanging loop for a braided one. Prototype closure elements. Quilting template and kumihimo disk. 3/2 cotton for the braids. 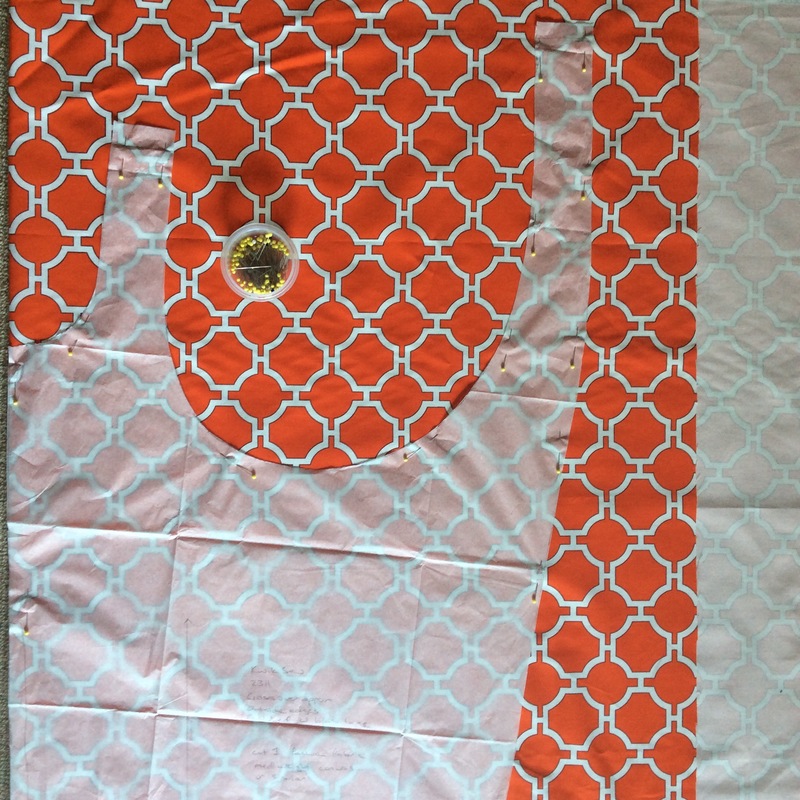 This apron was based on Kwik Sew 2311. I’ve been wanting to make a cross-over apron for a while and had been planning to draft my own, until I discovered the pattern in my collection. I avoid using bias binding as the commercial product tends to be poor quality fabric and it’s almost always too narrow for my purposes. I usually make a hash of attaching it, too, so used a Hong Kong finish at the neck and along the arm and double binding on the back and hem. 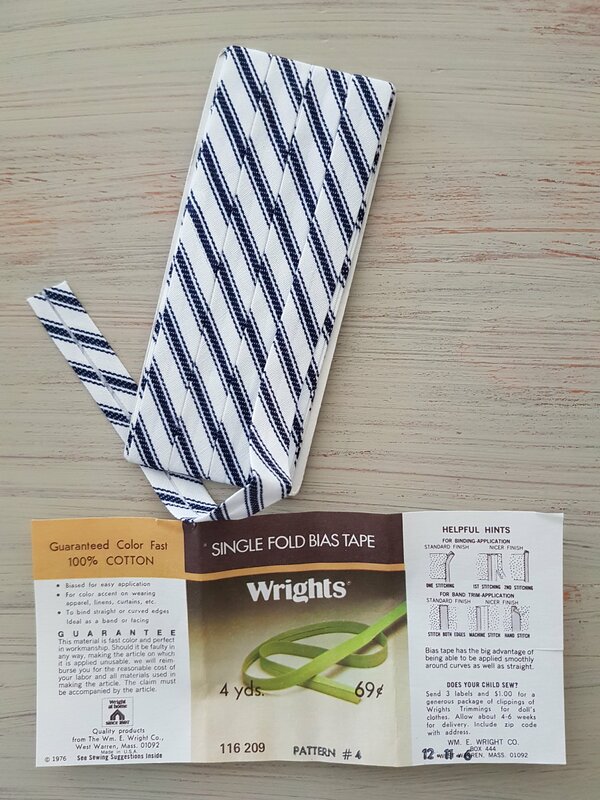 The binding fabric is remnant from Spotlight, of Premium Cotton Sateen in Wedgewood colour, purchased for $1 when they had all their remnants on sale, but normally priced at $16.99 per metre. The binding fabric width was 127cm. I was only able to verify that the fabric was 100% cotton after taking it to the register and asking the staff to scan the bar code, which fortunately was still attached. The fabric seemed to have some spandex in it as it was moderately stretchy and I was able to cut my binding strips on the cross grain. Next time I would stay stitch the neck before attaching the binding. I might also play with the back shoulder component of the pattern to make it curve a little more, for a better fit to the body. I omitted the button closure in the original pattern. Closures on aprons can so easily open at the wrong time, not something I want in my workwear. It’s easy to put on and take off without the button closure in the original pattern. I did test that before sewing the shoulder seam. I made a visit to Fabric Outlet in the Mission District of San Francisco in order to post a review as a community service to you all. In truth, I was was pretty keen to to see the place as it had such good reviews on line. I’d been to the Mission District before, where Fabric Outlet is located, in order to visit Gracias Madre vegan Mexican restaurant, which Tinkerer and I were invited to on a previous holiday after requesting an authentic San Francisco dining experience. I loved Gracias Madre but I think it’s fair to say that Tinkerer regards vegan cheese as a bridge too far. I remembered the area around the 16th and Mission BART station as grimy and impoverished. This time I visited in the mid-morning and I found the area downright unpleasant. If you decide to visit, wear closed shoes, or at least your Birkenstocks to get your feet off the ground a bit. I understand that homelessness and poverty are complex problems to solve, but getting a street cleaner out on a regular basis should be manageable by the local authorities. The stench of urine around the BART station was overwhelming. And don’t get me started on the pigeons. If you have a bird phobia at all, stay away. It was a short walk to Fabric Outlet and I recommend visiting if you have a need for a specialty fabric or anything unusual such as fake fur, or leather, or sequins. The range is excellent and includes notions, patterns and upholstery fabric. Prices seemed reasonable to my inexperienced eyes and they had a 40% off promotion running on the day I visited. Sadly for me the promotion didn’t include oil cloth, which was the one thing I was looking to buy. The style of the store was also more human than you might find at a fabric store at a suburban mall, perhaps due to it being located in a basement and having fewer bright lights to dazzle you. The only fabric I brought home that day was a couple of metres of new quilting type fabric from Thrift Town next door. I’m still not sure if it is 100% cotton or a blend, but as I’m planning to use it for rug weaving I’m happy either way. This has already proven itself to be a very wearable summer dress. I found the pattern at my local thrift store and used the smallest multi-size available, which was 16. I read recently that the big pattern companies haven’t changed their sizing in a very long time and that you need to use the measurement charts rather than your normal dress size when selecting a pattern. Based on this experience that sounds about right. I wouldn’t buy a ready-made garment in size 16, but this dress was a reasonable fit. Admittedly it is designed to be loose fitting, so there’s a bit of intended wiggle room (aka pattern ease). Pattern and construction adjustments: roughly two inches of length removed from the bodice, bust dart extended, longer zipper than recommended as I used a zipper from my stash, no hook and eye closure above the zipper, French seams on the side seams which resulted in seams of about 1.8cm instead of the called for 1.5 cm. What I would do differently next time: slightly lower the bust dart, make a small full bust adjustment, better workmanship on the zipper, stronger stitching at the start and end of the sleeve, follow the construction instructions. I got myself in a spot of bother by inserting the zipper before sewing the neck/arm facing, which meant I couldn’t turn the two back sections through the facing. I got out of trouble but not turning the facing at the armscye and instead sewing through all thicknesses from the right side. developing the solution took a bit of thinking and was a valuable learning experience. I should, of course, have anticipated the problem, but I didn’t. 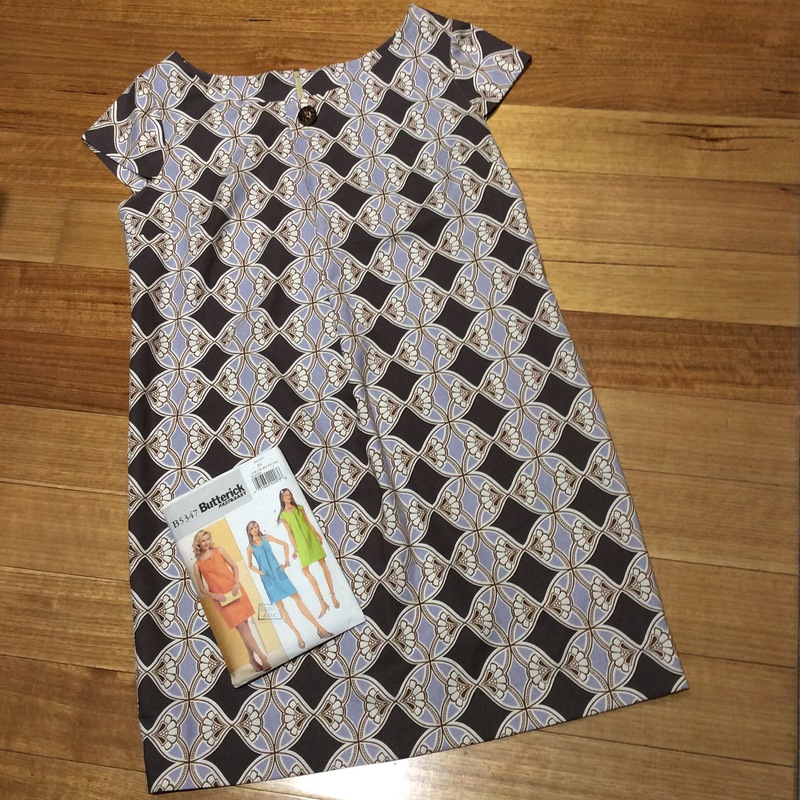 This dress was my first project with my new Janome sewing machine. Rather than spending time sewing scraps I decided to just get on with a real project to get familiar with the machine. I had to unpick a little more than usual but I had a wearable dress at the end of the process. Happy with that.